Two special Break Chance Memento PDFs available now! 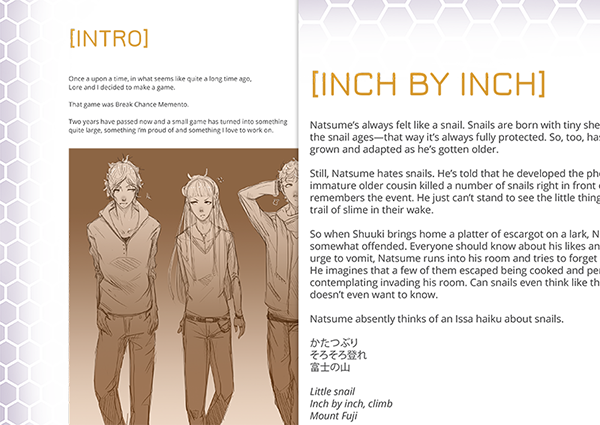 One is an art booklet with BCM-related sketches, concept artwork, comics, and progressions by Auro-Cyanide. It's chock full of BCM art that you can't see anywhere else yet. 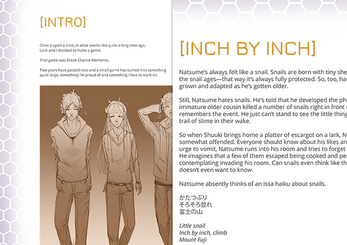 The other booklet is a story booklet of non-canonical BCM-related stories by Lore, including two R-18 pieces. Both booklets also contain commentary/notes from Auro and Lore. Break Chance Memento (BCM) is a BL visual novel in progress by Cyanide Tea to be released December 16, 2015. For more information, please see the official BCM website. Small bit of usability feedback: in the options, Auto Forward Speed and Text Speed aren't consistent in direction - to make the text speed instant I have to fill the gauge (pull right) but to make the AFS faster, I have to pull it left, making it empty. It took me a while to figure out, I kept tweaking by small increments and didn't seem to get any improvement. Ideally, you'd change the AFS to be like the text speed, so it's much more intuitive to know what to do. Some games actually provide a text preview in the settings, but I guess that would be a bit overkill at this stage in development.